Moscow hopes that Brazil's Roberto Azevedo will revamp WTO's decision-making and simplify market access for developing countries. 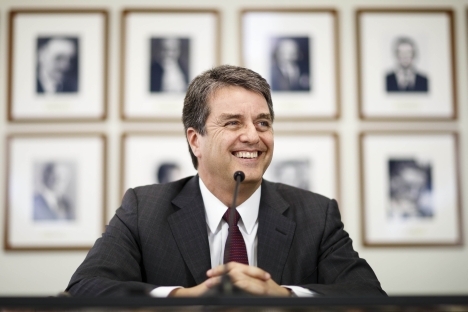 For the first time ever, the World Trade Organization (WTO) will be headed by a representative of Latin America, a 55-year-old diplomat from Brazil, Roberto Azevedo. Experts believe that his appointment would benefit developing countries, primarily BRICS. "The appointment of Brazil's Azevedo is a logical recognition of the growing part that developing economies are playing globally. It also marks a strengthening of the positions of BRICS, whose member states are leaders among the developing countries," said Nikita Maslennikov, adviser at the Institute of Modern Development. In his opinion, despite the fact that the WTO head's functions are more organizational than anything else, one may expect Azevedo to come up with initiatives aimed at resolving issues that are of primary concern for BRICS countries. If only because of his origin, Azevedo is better familiar with the practicalities of these issues than his predecessor, France's Pascal Lamy. Therefore, Moscow too may expect certain advantages from this appointment. In voting for the new general director of the WTO, Russia supported Roberto Azevedo. Russian Deputy Economic Development Minister, Aleksey Likhachev, said at the time that his appointment to that post "had very big potential for developing our trade and economic cooperation with countries of that region." "We very much hope that with the arrival of a new and active man to the post of general director, a person who holds the same views as us, we shall be able to, through the mechanisms of the WTO, to find new levers at the level of the global trade system for further developing trade and economic relations," he said, as quoted by the Interfax news agency. "Brazil and Russia have common problems and normal business relations. Moscow will find it easier to agree with Azevedo on issues that concern it. Some of the main decisions expected from him have to do with removing barriers and making access to the world markets easier for developing countries," said Aleksey Portansky, former head of the information bureau for Russia's accession to the WTO and professor at Higher School of Economics. There's been no progress since the Doha Development Round on the further liberalization of world trade commenced in 2001. Portansky believes that the new head of the WTO will be able to come up with an initiative for revising the decision-making mechanism inside the organization. At the moment the WTO's 159 members are governed by the consensus principle and a balance of interests, whereby for a set of proposals to be approved, they need to be supported by each of the member states. This impedes the organization's development and results in a proliferation of restrictive measures. According to Maslennikov, between 2009 and 2013, against the backdrop of a global economic crisis, the number of these trade barriers has tripled. If previously, only 1 percent of international trade was in direct breach of free trade rules, now this figure has grown to 3 percent. For Russia, Azevedo's election is important for image reasons too. It's there that the new WTO head is likely to unveil his program. "In September, St. Petersburg will be hosting the G20 summit, at which the new head of the WTO is expected to announce his first initiatives. An agreed upon position by those countries would serve as an outline for the organization's final document, since G20 accounts for nearly 90 percent of the world's GDP," Maslennikov explained. Officially, Roberto Azevedo will assume leadership of the WTO just before the summit, on Sept. 1, when the powers of the incumbent head, Pascal Lamy, expire. Before then his candidacy is yet to be approved by the organization's General Council. Azevedo is an engineer by training. After graduating from the Diplomatic Academy under the Brazilian Foreign Ministry, he joined the ministry's staff in 1984. From 1997 to 2001, he worked at Brazil's mission at the UN. Since 2008, he has been representing Brazil at the WTO. Azevedo has become famous after his high-profile trade disputes with the U.S. over its subsidies to cotton farmers. He advocates a further liberalization of the world economy and the completion of the Doha Development Round.